Eugen von Böhm-Bawerk we are told demolished the logical basis of Senior’s Abstinence theory of interest in his History and Critique of Interest Theories. This critique was instrumental in leading to the later bifurcation of interest rate theory into those of pure time preference or pure monetary forms. But his criticism was deeply flawed. I had sketched out this post when in checking references I came across the following in Schumpeter’s History of Economic Analysis. But Schumpter did not present a counter argument- simply stating that ‘I have never been able to understand’ Böhm-Bawerk’s accusation that the abstinence theory involved double counting. This post does present an argument that Böhm-Bawerk’s reasoning is flawed, it does not attempt to defend the Abstinence theory in the form that Senior presented it – which was rightly ridiculed by left-ricardian writers and Marx as a reward for sitting on one’s arse; but this theory was radically developed by subsequent writers such as Scrope, Mill (less so), Carver and even Marshall in a form then depended not on subjective utility costs of waiting but instead of opportunity costs of capital formation and consumption, and it was in the Marshallian form that it formed the basis of Keynes theory of investment and liquidity preference. It is important then to resolve the ‘late classical’ theory of interest of false accusations of error – important because the Sraffan revival of classical cost of production theory simply leaves the interest rate issue unresolved and is entirely non-monetary. By reviving the approach of seeing interest as a cost we can take a step towards resolving this. Senior’s original presentation of the concept of ‘abstinence’ was utilitarian. Consumption was a utility, abstinence from consumption a disututility, however abstinence from consumption enabled saving to create capital – the factor reward of which was interest. This approach then solely focussed on savings and was compatible with Smith’s classical theory of growth in which growth was caused by savings to create capital goods. Scrope called this a ‘very great mistake’ in his unification of the abstinence theory with productivity theory. Therefore the value of time is that it provides a period during which productivity can create value. There are too elements to this ‘sacrifice of time’. Firstly a period of saving of an income stream to acquire the capital (fixed and working) necessary to fund production until profitable (what Austrian Economists would later call the ‘pool of funding) – the turnover period of capital – secondly the period of production itself after the period of saving. This need not imply any moral presumption about the justice of factor returns, we simply assume that the ownership of a resource brings with it the opportunity to benefit from any income stream generated by that resource. Senior stated that if price is equal to the cost of factors of production then the period of time that elapses during production must generate the additional cost. Whilst for Senior the cost of this waiting was disutility Scrope was more specific it was the opportunity cost of the income stream during that period that would otherwise have been consumed. But this did not satisfy Eugen von Böhm-Bawerk who disputed that abstinence had a ‘cost’ . Böhm-Bawerk took from Rae the idea that sacrifice of present consumption goods for future consumption goods, to the extent that the sacrifice led to production sufficient to compensate for that sacrifice. The kernel of Böhm-Bawerk’s system was that a capitalist must have wait for an income stream from capital to mature, or either sell it to someone else, in which case it is the buyer who waits. The waiting consists of giving up the opportunity of buying present consumer goods, and receiving in return the means of securing consumer goods at some point in the future. It is ‘virtually’ an exchange of present consumers’ good for future consumers’ goods. Scope and Rae, followed by Böhm-Bawerk and later Fisher were effectively seeking to integrate the abstinence and productivity approaches. This insight was accepted but proponents of the abstinence cost theory, such as Thomas Nixon Carver, that disagreed with the inference that Böhm-Bawerk drew from this. Böhm-Bawerk argued then this explanation involves a double counting. That is, the cost of abstinence (if it exists) is already included in the cost of the other factors of production. Thus Senior’s theory is faulty. He has not explained the higher price of final goods relative to their costs of production, because his alleged missing component of abstinence is already accounted for. Suppose that our man chooses in favor of the apples, and devotes his day to planting seeds. That evening, a great storm comes and completely ruins his field. In this unfortunate case, what is the cost of the man’s decision to plant the seeds? It is quite clearly one day’s labor: the man has wasted a day toiling, and now (because of the storm) has nothing to show for it. He could have spent the day relaxing, and would have been in the same position after the storm. Since there will now be no apples forthcoming, the mental anguish associated with waiting for their arrival forms no part of the costs of his decision to plant the seeds. The argument is that the anguish of waiting is counted in the wrong place it should solely be counted on the demand side in terms of the subjective disbenefits of the consumer of waiting many years for the apple tree to grow. This insight provided the basis of arguments from future writers such as Fetter that interest should be solely considered a subjective matter of the consumer – pure time preference – and has nothing to do with cost or productivity. There is a crucial mistake in this account however, it is one without money or debt. It is the interest cost of money we are seeking to explain. There is some irony here as Murphy, like Locke and Fisher, argues that interest is nothing more than the discount on the price of money. Böhm-Bawerk is asking us to imagine an investor not consuming a days labour worth of apples today for the present value of an income stream of apples that comes on stream in 10 years time or so. But that makes the presumption that the investor has already saved a days labour worth of apples in the first instance, which they are indifferent to consume at the anticipated price of apples today and in the future. But an investor will decide whether it is worth such a sacrifice of consumption at a specific interest rate, his argues presumes what it sets out to prove. If an investor has not saved a days worth of labour then they will be forced to borrow, if they have borrowed then they will not be indifferent to the impact of a storm as this may wipe out the crop but the debt remains to be paid. The repayment of this debt will add to the cost of hiring each factor of production and this cost of the money borrowed will reflect the risks the creditor undertakes including the risk of a storm wiping out the crop. Such a storm would reduce, in terms of probabilities, the physical return of apples. It is only because there is likely to be a physical return, on items of value that an investor is likely to give up the certainty of a stock of consumer goods today for the uncertainty of a potentially higher amount of consumer goods in the future. A traditional Austrian response here is that interest is a physical phenomenon that exists also in a moneyless world. We all know of the example of Crusoe alone conducting saving to construct a fishing rod, but what is we add exchange into the equation and Friday lends Crusoe his days coconuts with the aim of repayment from sales of fish to another island. Friday may totally trust Crusoe to repay but at any time Friday might emigrate to another island. So therefore some units of account is needed to measure the debt, and that measure of debt may subsequently be traded. We see then in any mythological fantasy of a pure barter economy units of account for debt intrude, indeed many modern authors such as Graber see measurement of debt as a store of value as the true origin of money, and indeed early forms of money took the form of debt tallies. We can therefore reject the Austrian theory and see that in any economy with debt waiting has a true factor cost to input prices. Confirmation of that is that for someone who has accumulated capital the opportunity cost of leaving it leaving it as an idle balance is the return you would earn from investing it or lending it out. In value terms money left idle will depreciate in purchasing power terms by the risk free return rate in the economy. Therefore waiting has a ‘cost’ in value terms because money left waiting loses purchasing power. This also deals with Fisher’s very similar objections (chapter 3) to abstinence theories, that to be a true cost it had to be an out of pocket expense. A sidenote. Waiting – or to be strict waiting services, is not the only cost attracted by the passage of time, there is also depreciation services. Both together make the aggregate cost of time. This is one key way in which land rent differs from rent on money used for capital investment. If the condition of land is maintained it does not depreciate. Each time cost factor will act in different ways on each factor product, applying a discount rate. It is therefore the sum of the discounted factor products that creates the total cost of production. In any economy there will be differential between those that own outright the means of production and those that borrowed to produce. In this case interest acts rather like differential rent – reducing the maximum profit on physical capital and diverting that as rent to the holders of money capital. Carver contemporaneous with Böhm-Bawerk‘s key writings was also critical of his attack on the abstinence theory. So from the perspective of the lender of money the cost is the opportunity cost of that money, from the perspective of the borrower it is the future opportunity cost of making payments on the loan. If a process is productive then the future income stream from the investment will exceed the opportunity cost of the loan payments. For the lender the future income from the productive process must match or exceed the average rate of profit and be of a sufficiently high level to overcome any preference for liquidity. The base case that Carver used though was less than convincing. He imagined a zero profit baseline where there would be no incentive to save via investment. Here future consumption via an investment channel would be zero so an increment of funding for new productive processes would need to attract savings at the margin via an increment to the rate of interest. Four objections could be made to this approach. Firstly that a baseline case of zero profits is not realistic. The average rate of profit could be at a range of level or negative. Secondly in this pre-Keynesian form there is the assumption of a loanable fund of savings preceding investment. Thirdly that an assumption of productivity of capital has fallen into a capital theory fallacy. Finally Fisher’s objection that interest did not add to cost of production. On the first point we do not have to assume a zero rate of profit, we simply need a system for determining the relationship between changes in investment and changes in savings. Let us assume that a productive system has a rate of investment sufficient to pay for all depreciation of capital stock but not for any expansion of capital stock. Utilising our double entry model of banking if all bank profits are returned as dividends then the change in lending must be funded by a change in savings. This saving can utilise idle/excess reserves, reserves that will in time be generated by the act of lending. But as our modelling has found those reserves are likely to be in another bank so an expansion of bank lending must be found through funding, either a short term intra bank or central bank loan or through equity. Both of these will be set through the opportunity cost of capital in the market. We can therefore deal with the first two potential objections simultaneously. In order to attract finance capital the rate of interest, after accounting for depreciation, must be able to compete with the average rate of profit from other investments. Interest enters into the cost structure of every other factor of production. It is the discount of the cost of those factors. Note we are speaking here of the perspective of the individual firm which sees (differential) rent costs as price determining, rather than that of the whole of society. Arbtitrage ensures that the interest rate – costs of lending is equal to the average rate of profit. Fixed capital goods will depreciate, and variable capital goods will be used up in the process of production. We can term these elements together capital destruction. The cost of these inputs will in turn be determined by the cost of intermediate goods created and then used up in the process of creating final consumer goods. The top layer here represents consumer goods. This is also a visual expression of Bose’s theorem, that all intermediate goods have labour/capital composition and there is no such thing as a pure labour good, so capital contributes to value as well as labour. This line of argument has weaknesses, crucially when taken back to ‘originary factors’ that capital residuum is original interaction of land with labour – rent – which is not value creating. Secondly there is Marx’s argument that depreciation simply maintains capital and does not add value – this omits of course working capital used up in production and maintained in the final good – which again can be tracked back to rent. The issue is how capital goods are valued – to the extent to which they can augment labour. The real factor that this monetary exposition of Bose’s theorem exposes is the role of finance capital used in production. Ironically if you maintain the position that money results from surplus created by augmented labour, and that interest is rent of money, then interest becomes price determined when viewed from the perspective of society as a whole. The issue then becomes one of measurement of units of augmented labour and whether or not these are aggregatable. We can also see Sraffa’s argument that there is no such thing as a single undifferentiated ‘capital’ earning a factor return, rather there is the discounted cost of capital consumed in production and secondly the interest rate on each individual factor. It is impossible to determine the overall cost of production, and profit rate, without knowing the interest rate – leading to Wicksell effects. This is not necessarily incompatible with a marginal productivity approach to factor costs. This can be applied to interest rates and rent, the area of caution is over capital and labour which must always be used in conjunction and where it is only possible to talk of the discounted marginal productivity of augmented labour. This relationship is not however monotonic and linear, varying capital/labour rations and relative costs of each will have interest entering differently into the cost of each will will effect choice of technique – reswitching. There is a very simple relationship between: the price of land P (measured in tons of wheat); the annual rent on an acre of land R (measured in tons of wheat per acre per year); and the rate of interest r (the extra tons of wheat per year you have to pay as interest to borrow one ton of wheat). It’s P=R/r. Or you can think of it as r=R/P. Arbitrage ensures that equation holds true. If r>R/P, the rate of return on owning land and renting it out would be less than the rate of interest, so everybody would want to sell land, driving P down. If r<R/P, the rate of return on owning land and renting it out would be greater than the rate of interest, so everybody would want to buy land, driving P up. Or you can set the price of land equal to the Net Present Value of the rents, and get exactly the same answer, if you assume that rents are never expected to change and interest rates are never expected to change. Rowe assumes that this proves that interest is solely determined by time preference. But note here the factor input – seed – is presumed to arrive by magic and labour input is assumed to proceed without having to eat. We can simply reformulate this however into a one product corn economy model. Here rent of land can be determined in value terms solely in relation to productivity. “Yes we do! “Capital” is just a strange name for land that we drained ourselves, instead of waiting for God to reduce the sea-level. Saving and investment is just like having a flood this year, and so consuming less wheat, barley, or whatever, this year, and a lower sea level and more land next year. .. 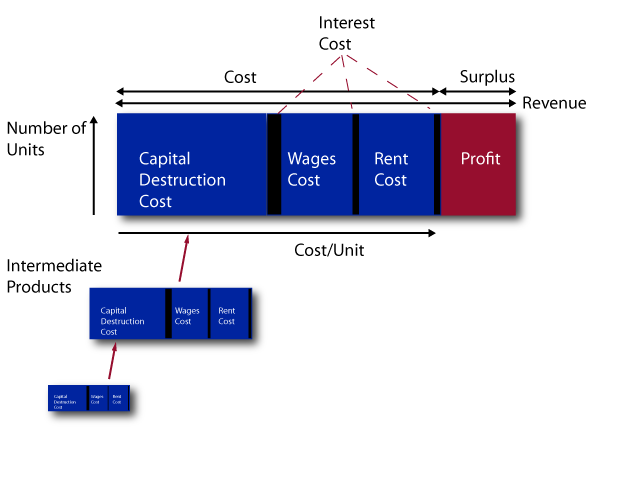 So capital can be seen as rent – where rent, and interest, is set by the cost of an additional unit of output where the marginal cost equals the marginal opportunity cost of investing a marginal increment of deferred consumption elsewhere. Interest as the rent of money, the thesis we set out to prove in the ‘four factor model’ we starting setting out a few months ago. Does this rent enter into price, or like land is it price determined? Fisher strongly argued that that it did not enter into price when viewed from society as a whole as expense to a debtor is income to a creditor (assuming of course they have the same preferences). Note this is not an argument of the debts=credits form inapplicable with endogenous money, rather one of where debt payments=creditor income, which is an accounting identity true at any instant of time. Like rent the fact that a cost does not contribute to price does not disprove a cost of production theory of value. We can also see the relationship to concepts of liquidity preference and the demand for money. Active investment by an accumulator of capital has to compete with other demands for money including paying down existing debt. 1. von Böhm-Bawerk, E., Capital and interest. 1959: Libertarian Press. 2. Schumpeter, J., History of Economic Analysis. 1987: Taylor & Francis. the Theory of Interest,’ Quarterly Journal of Economics, October 1893. 4. Scrope, G.P., Principles of Political Economy. 1833: Longman, Rees, Orme, Brown, Green, & Longman. 5. Rothbard, M.N., Economic Thought Before Adam Smith. 2006: Ludwig von Mises Institute.